It is over 179 feet of delicious fried pork sandwich. 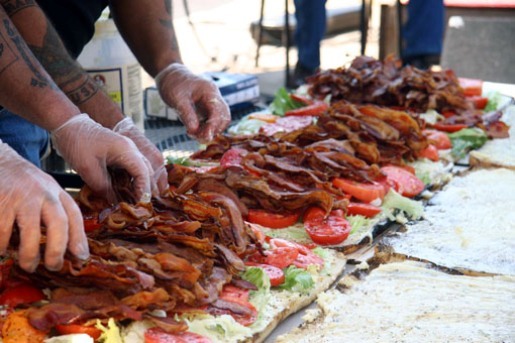 Iron Barley owner Tom Coghill’s dream of building the world’s longest bacon, lettuce, and tomato sandwich is now a reality. It took 500 pounds of bacon, 500 heads of lettuce, 48 gallons of mayo, 80 pounds of butter, and a staggering 1280 pounds of tomatoes. Good thing the sandwich was put together to commemorate St. Louis’ fifth-annual Tomato Fest, eh? I doubt they’d run out of tomatoes there! However, I’m not sure if it really is the world’s longest BLT. As a friend pointed out to me while hungrily discussion the tastiness of the giant sandwich, it’s clearly cut into divisions. Then again, they did toast the bread with a blowtorch, so maybe this bar’s hangover-curing stunt still qualifies as the world’s coolest sandwich. I really need to not do these food-related posts before breakfast, because I am now officially starving and I have no way to get my mouth wrapped around a bite of bacon-y goodness for an hour and a half still. My coffee and yogurt breakfast just isn’t going to stick with me now that I’ve perused seven pages of BLT photos.